Want to test your knowledge of the creatures of Dragolandia? Dragon Academy, with the help of professor Hogwin, is hosting exams for aspiring dragonologists, both young and old. The first exam focuses on the most basic skill – identifying those magical creatures by name. No worries – you can practice your skills as long you want before taking the exam. Also, finishing one successfully opens up a higher difficulty level, testing your skills even further. Good luck, fellow dragonologists, and may the Dragon Gods smile upon you! Note that the exams are accessible only for registered DML Planner users, currently. Collector Points weren't calculated properly in some cases. 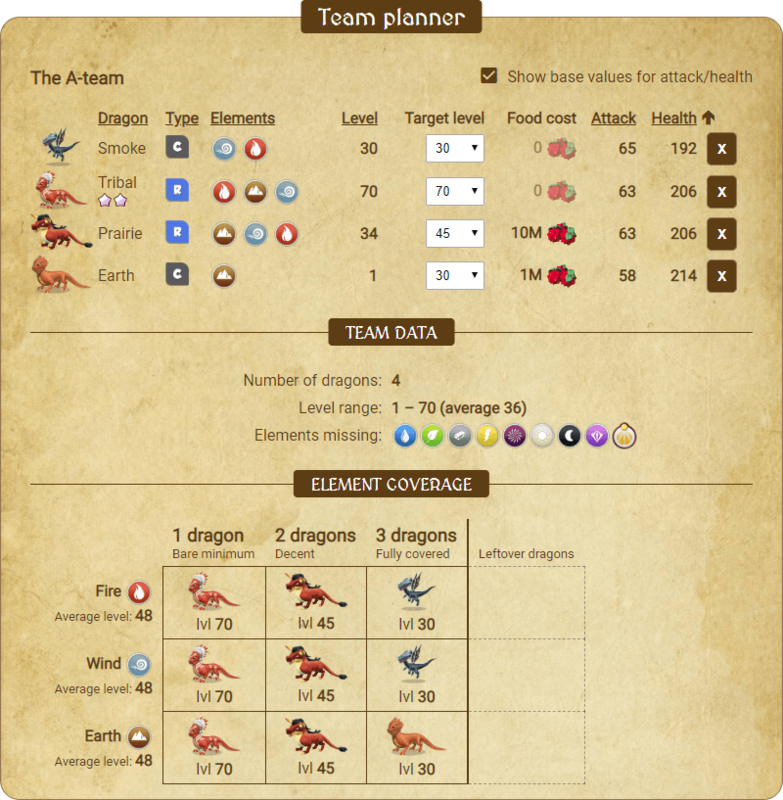 If the variety of dragons in the game makes your head spin and you find it difficult to choose which dragons to level up, then maybe the new team planner may be of help. What it does is give you an overview of how elements are covered in your team, helping you spot missing elements and also cases of overcommitment (where too many dragons have the same element). Having a balanced team is important (particularly in castle events with their element restricted battles), both for new players and especially those who are slowly transitioning from mid-game to end-game and need to decide which dragons to take past level 70-80. Select a dragon, specify its current enchantment level and see exactly how many materials are needed to upgrade it to a higher level. 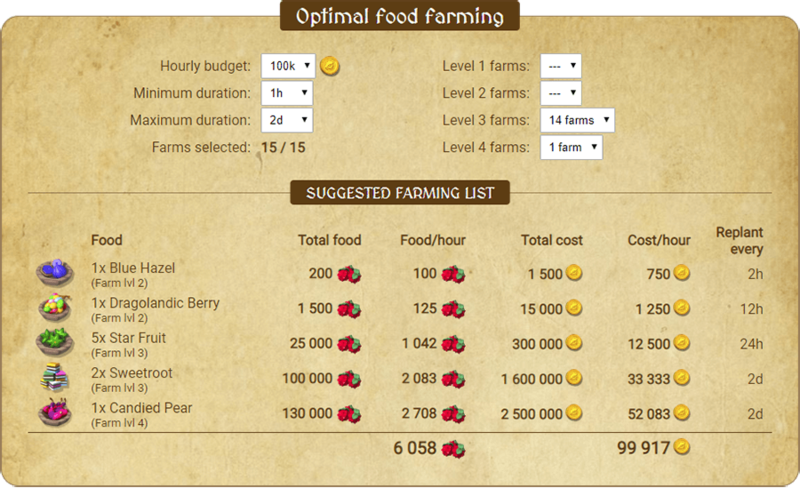 If you're a new player and looking for inspiration on what food to grow in your farms, then why not try the new farming calculator? 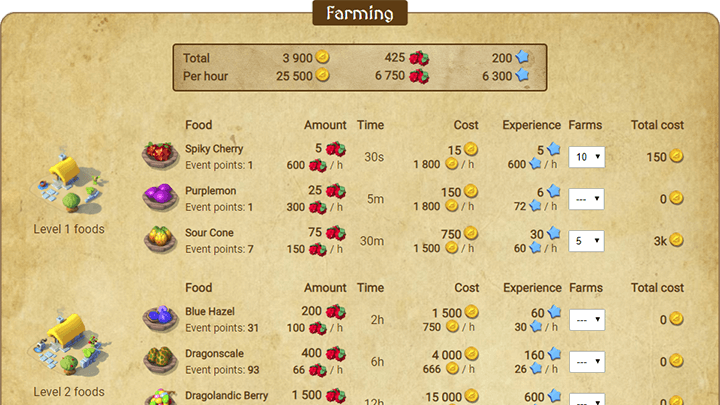 Just mark your farm levels, specify your hourly gold budget and see how the planner would do the farming. 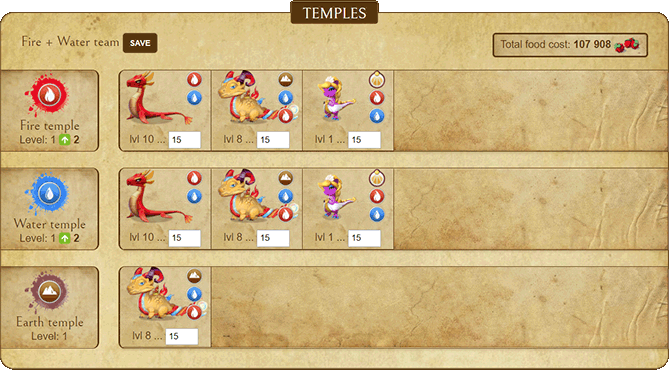 Temple planner page now reacts to bigger displays, showing more dragons at once for each temple without requiring the user to scroll. Fixed a bug which prevented searching dragons that had "Gold" in their name (affected Golden, Golden Green and Golden Crow dragons). The focus of this month's update was to make the breeding calculator great again. As a result, the calculator has been vastly improved, to a point where it should be able to calculate every possible combination in the game, of which there are over 15 000 (or over 200 000, depending on how you count them). Support for chain breeding events... Check! Using legendary dragons as parents... Check! You can now even breed a dragon with itself to see what the outcome would be. Breeding results are now ordered by success rate. The two breeding modes - normal and reverse - have been brought to the same page, making it quicker to switch between them. 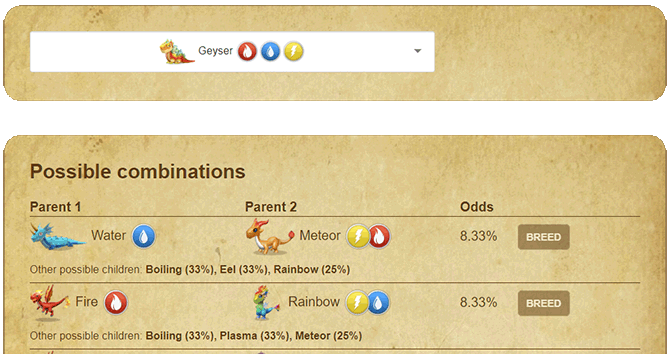 Dragons already in user's collection are highlighted both in the normal breeding results and for event dragons. New DOTW/DOTMs will be listed under Event dragons as soon as they're announced in the official Gameloft forum, allowing you to plan ahead a few days. 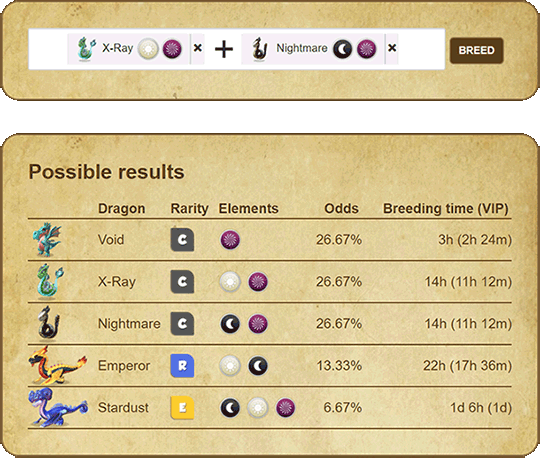 Added VIP times for breeding and hatching on the Dragons page. 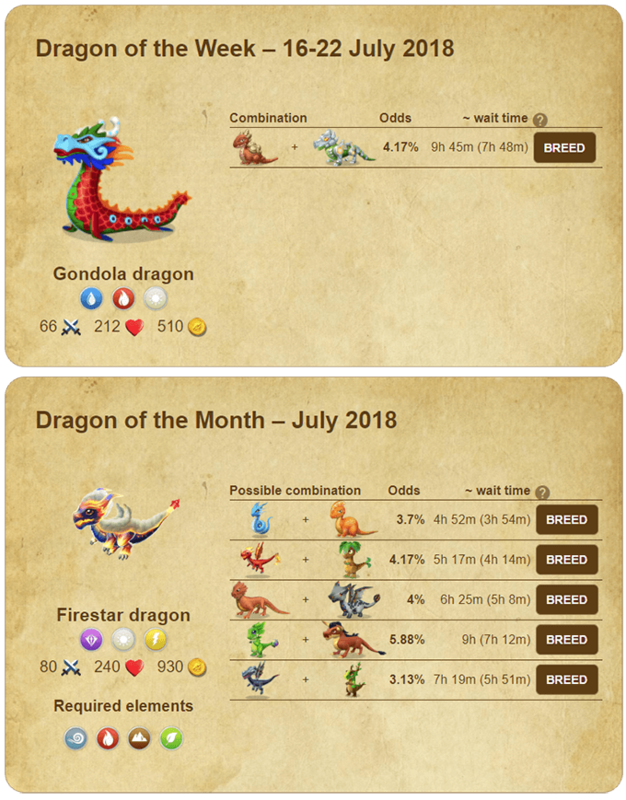 Some Legendary dragons were incorrectly reported as Dragon of the Month on the Dragon Analysis page. Fixed Wiki links for boss dragons not pointing to the correct page. What good is a food calculator if you don't have the food to begin with? Farming calculator helps you fine-tune your food growing strategy by providing relevant metrics like food per hour for each food. There are now filters for showing both the unhatched dragons in your inventory and the ones in the vault. Switching to unhatched dragons also shows the times for breeding and hatching, and also the amount of collector points they're worth. An experimental feature that displays a couple of game progress related stats, like the amount of unique dragons in your collection and collector points. Note: Since it's still in development, it might feel a little empty at the moment. If it does, feel free to change your starting page back to Dragons on the Settings tab. Fixed a bug where uncollected dragons wouldn't be displayed in the search results, even after switching the "Collected dragons" filter off. Fixed a bug where Facebook login didn't work for users who had initially created their account via email. Using DML Planner on smartphones should now be less of a hassle. With this, the layout of the planner has also changed a little for desktop: menu is now on the left side, providing more vertical space for the content. You can now add dragons and change their levels from every page. Dragon's habitat can be accessed straight from the list. Dragons are automatically sorted by their level on the temple row, helping you concentrate on the first 5 dragons for every element. Temple levels reached with the selected dragons are now visualized on the same row, making it more intuitive to track the progress. On the temple row, you can now see food cost per each dragon separately. Since the planner has grown way bigger than I initially imagined, I felt that it deserved its own home. Time to let the shared domain go and welcome dml-planner.eu, its very own domain. 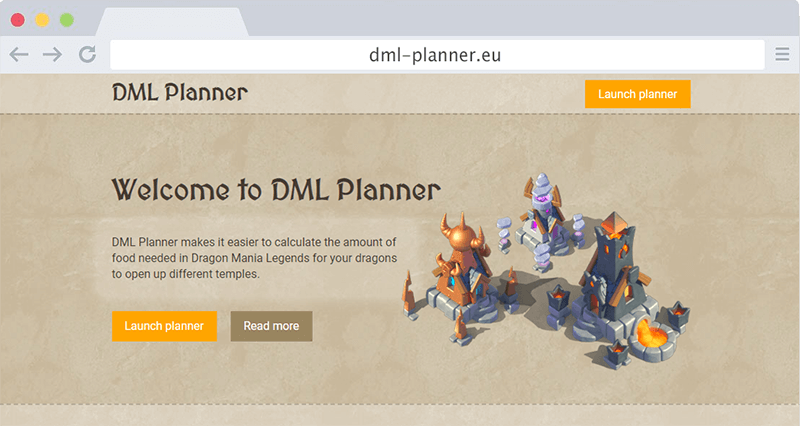 Players still wary of registering an account to use DML Planner can now try it out first. Since the data will be stored locally in the browser, then there's two caveats to consider. First, you can view your data only on one device, since the inserted data is bound to that device. Secondly, any accidental browser cache cleaning, either directly or through a third party solution (e.g. CCleaner) will wipe the data clean, meaning you'll have to add all the dragons/habitats/levels all over again. To avoid accidentally losing locally saved data, users can, after trying out the tool, create an account, go to the Settings tab and then sync the previously inserted data onto the newly created account. For users who don't actively read DML Planner's thread on Gameloft's forum, there's now a separate updates page (this one!) where they can keep themselves up-to-date on the planner's development. "Show only collected dragons" filter didn't display any dragons at all in some cases. 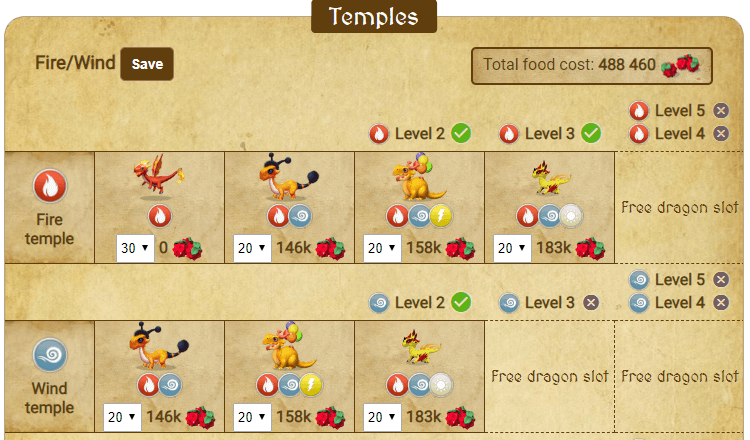 Dragon search is now fully reachable on Temple/Economy/Food pages, rather than staying behind the corner on smaller displays. 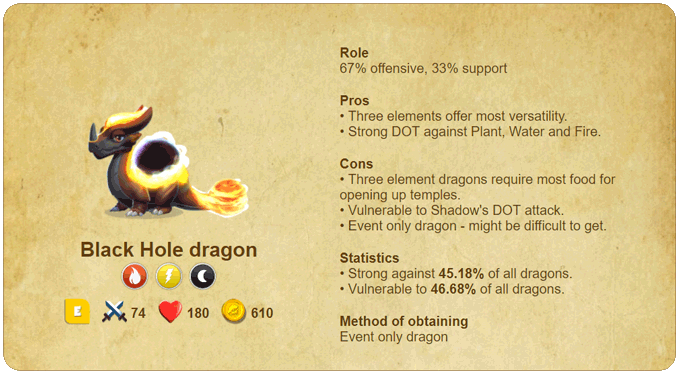 From the Dragons page, you can access the new Analysis functionality which tries to summarize the pros, cons and other various tidbits about the selected dragon. I tried to make it as objective as possible, without any bias. If you feel that certain things are not covered here, let me know. Analyzing multiple dragons at once is also available. On the Analysis page, click on the Dragon Comparison button on the top right, which takes you to the comparison page where you can add up to 5 different dragons into the mix. By default, highest and lowest values will be highlighted, but this can be switched off if needed. 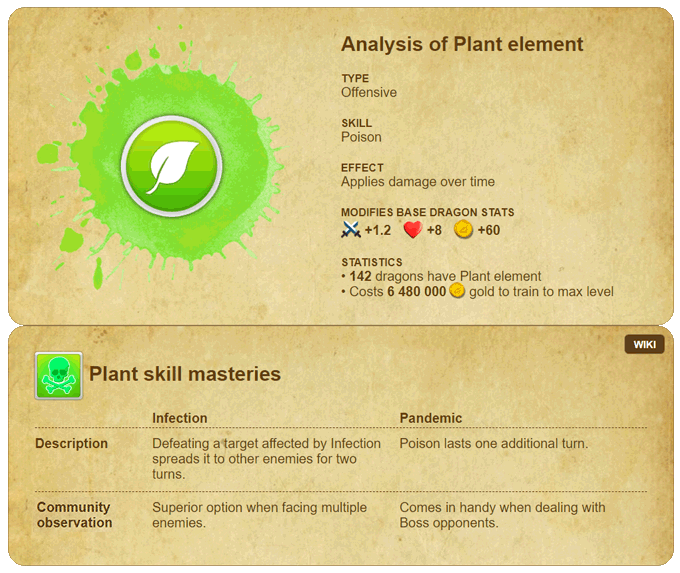 On the Dragon Analysis page, clicking on any of the dragon's elements will take you to Element Analysis. Apart from some basic stats about the element itself, it also covers the masteries and tries to provide a suggested path, marked as "community observation". Economy page now allows you to calculate gold income over longer period than 1 hour. This helps you to spot when exactly is gold starting to go to waste if you don't collect it. 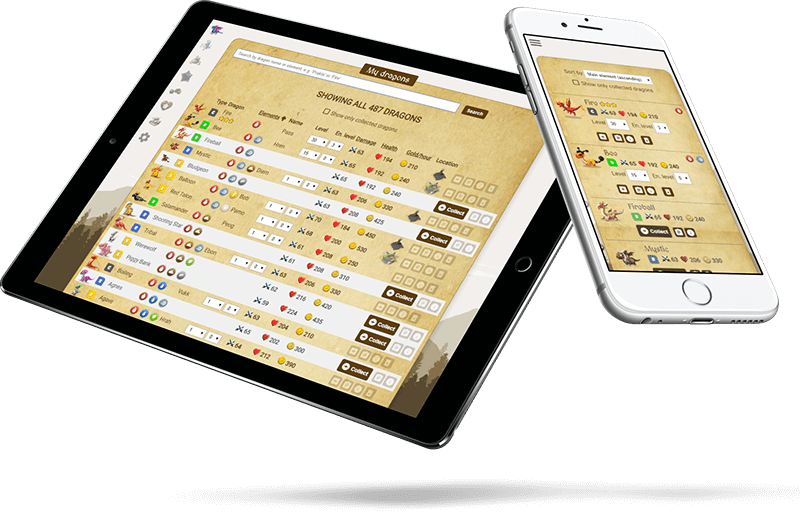 DML Planner can now notify you when it's time for another round of gold collecting. On the economy page, you can set up notifications to happen on a regular schedule. Have a look at your average fill rate to calculate an interval that makes the most sense. For now, this is available only on desktop. If you feel that this feature should be on mobile as well, let me know and I'll look into implementing it there too. You can now mark enchantment levels for your dragons, and also specify which dragons are still in egg form. Just for stable management purposes for now. Really overdue feature. My apologies. VIP dragons will be added next. Added a simple filter for showing only the collected dragons. A rather elementary feature that should have been available right from the beginning, but better late than never, I suppose. You can sort dragons by their main element, type, damage, health and gold production. In addition, to have better overview of many dragons at once, you now have the option to switch to table view, which will minimize dragons into rows and make it easier to compare them with each other. 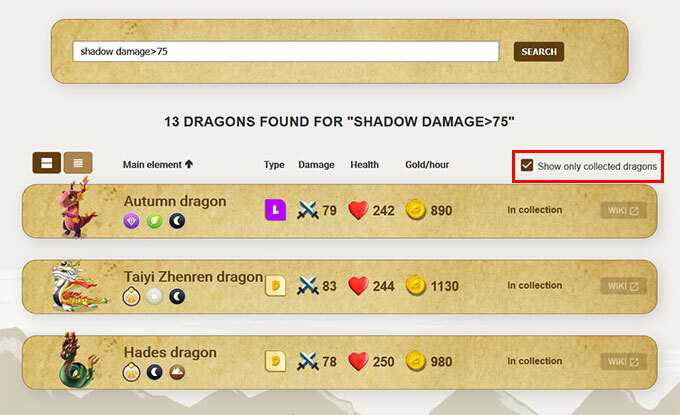 You can now search dragons by their damage, health, gold production and even body type! Searching by damage/health/gold requires you to use a comparator (either "<", ">" or "=") and a base value by which to search, e.g. "damage>70" will return all dragons that have damage over 70, "gold=500" wil return all dragons that earn exactly 500 gold, etc. You can also easily chain all of these search attributes together. Want to find all epic dragons with plant and energy that have 70+ damage and more than 200 health? No problem - "energy plant epic damage>69 health>200" is your search query here. When sorting dragons by element, the dragon order has been fixed: first element gets the highest precedence, then the secondary, then the third one. No more "Fire, Fire, Wind, Fire" nonsense. Clicking on a dragon's element will automatically search for all dragons with the same element. Boss dragons are now excluded from search results, unless specifically searched by name (e.g. "Twinkles") or by type ("boss"). Having trouble calculating how much food is needed for your dragons to grow in the long run? Have no fear, 'cause food calculators are here! Insert your current material and trinket count and the calculator shows you two things: 1) how much you can upgrade your materials given your material amount and 2) how much you can upgrade your materials given your trinket count. Select a dragon and get up to 50 different parent combinations. Combinations are sorted by chance (higher first), and also list other possible dragons you could get. Moving a whole habitat with dragons is now made easy by allowing you to mark a habitat (or even many, if need be) and selecting a destination island. Rewritten from scratch, focusing on the overview of which dragon affects which temple. You can plan out different strategies and then save those strategies for quick comparison later on. No more confusing options between plan and edit mode - it's all 100% planning now. Dragon search box isn't cluttered by already assinged dragons anymore, allowing you to focus on dragons that haven't been added to any habitat yet. A simple breeding calculator, mimicking the same functionality as the one at http://mobga.me/dragon-mania-legends/breeding-calculator/. I'm cautiously attaching Beta label to it for now, as in "always recheck the results with other breeding calculator(s)". I haven't spotted any incorrect breeding results yet, but if anyone does, then let me know and I'll fix that ASAP. I wanted the planner to have more fantasy feel to it, so the UI should be a little bit more game-y now. Dragon images are now always facing the same direction (yes, there were more than one user who noticed and reported that). Every dragon now has a quick link to DML Wiki for additional information. 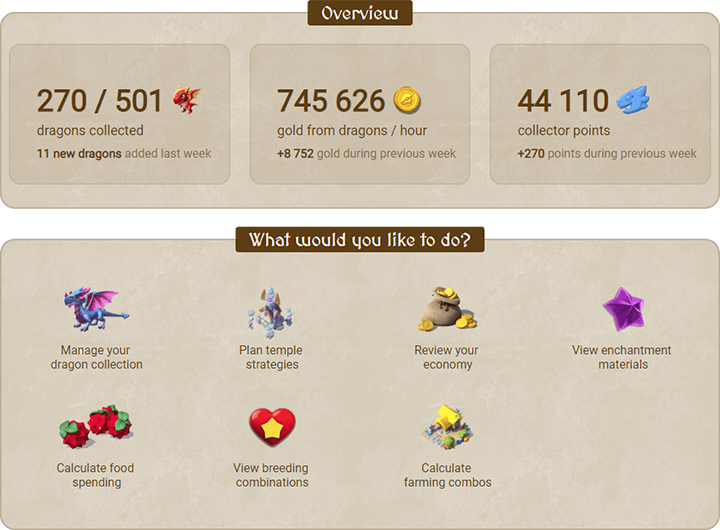 Dragons can now be assigned to habitats to help calculate the gold income per habitat and per island. This is helpful to see differences in the gold production and helps to spot inefficiencies in gold pickup. Refer to the Guide on how to use it. Added a very simple option to log in to the Planner via email. You don't even have to create a password, just fill out your email address and the system will 1) create an account for that email address and 2) send you a link through which you will be logged in. This way, there's no need for passwords – you can use the link in the email as many times as you want to get into the Planner. Ever since reaching level 70 with my main dragon Stardust, I've been contemplating on how to open up the necessary temples to allow him to go past that level cap. 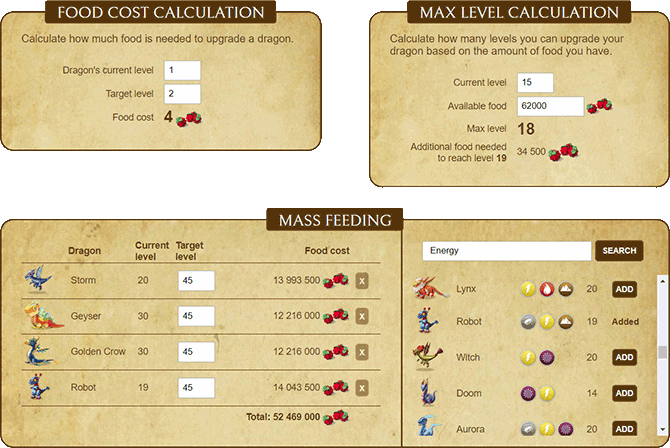 Since the food cost for levelling up additional dragons with the same elements (just to upgrade a couple of temples) is quite significant, I thought I'd create a simple web-based tool for myself that allows playing around with dragon levels and calculates food cost on-the-fly. Since I work as a web developer, I gave myself (in a typical hackathon fashion) 48 hours to come up with a solution. Nothing fancy, just the basic functionality of selecting your dragons and then playing around with their levels to see which path would be the most optimal for opening up those higher temple levels. I knew I wasn't the only one with the problem of choosing which dragons to upgrade, so I decided to make it publicly available to all DML players, regardless of the platform, so that everyone could freely experiment with their dragons. Assets used in this tool are all taken from DML Wiki page. No permission asked yet, will do that with utmost hurry. Promise.